The referendum result: a clear victory for the NO. The constitutional referendum held in Italy on December 4 determined that the constitutional reform proposed by Italian premier Matteo Renzi has not been confirmed by popular vote. A large majority of the voters refused to approve a controversial reform of the Italian constitution that politically divided the Belpaese. In this sense, the debate on this reform reached harsh terms in a long-lasting campaign in which, from many points of view, the vote took the shape of a vote in favour of, or against, the Prime Minister. From a technical point of view, the vote in this referendum confirmed the surveys that, since the announcement of the referendum, have quite always predicted a win for the anti-constitutional reform front; from a certain point of view, this prediction marked a significant difference with the polls before Brexit vote and Trump election. Nonetheless, the result of the referendum induced Renzi to resign, leaving Italy in political uncertainty. International reactions to the referendum result. International press has widely covered the Italian referendum. After the voting results, the German weekly newspaper Spiegel stated that the referendum’s result was a debacle for Renzi, but it should not be seen as a “no to Europe”; Frankfurter Allgemeine underlined that now it will depend on the Italian President Sergio Mattarella to decide whether to instate a technocratic government or a transitional government until next elections. British newspaper Independent showed the uncertainties linked with the “No” victory and the Italian political future, underlining the fragmentation of the political front against Renzi and the possibility of new elections being held before the natural expiring of the legislature. Furthermore, the newspaper emphasised the collapse of the value of Euro in the Japanese stock exchange following the referendum result. The Washington Post, on the other hand, bound the referendum output to the European establishment’s crisis and the rise of populist movements in Italy; according to the American newspaper, the concern related to the voting result lays also on the possible financial upheaval in Italy caused by the political uncertainty that it would trigger. Moreover, the Washington Post considered the referendum result in the face of Van der Bellen win in Austrian presidential elections, as a tile of a complex, European political situation. Finally, the Wall Street Journal stressed the economic implications of the result and underlined the danger of a bank crisis in Italy following the referendum result. How European political leaders reacted to the referendum. Political leaders in Europe have also reacted to the referendum output. Marine Le Pen and her niece Marion Le Pen, both prominent figures in far-right French party Front Nationale, rejoiced the result stating that Italian people repudiated not only Renzi’s reform, but the Premier himself and the European Union. UKIP leader Nigel Farage also bound the Italian referendum to Euroscepticism, while Geert Wilders, leader of the Dutch far-right party PVV, welcomed the result as an Italian victory. While European far-right party leaders were greeting the Italian referendum result as a blow to the EU establishment, on the other hand the European establishment tried to limit the referendum consequences as an “Italian domestic issue”. The Eurogroup ministers stated that the poll result in Italy is no threat to the Eurozone. German finance minister Wolfgang Schäuble declared that there is no reason to talk of a Euro crisis or the conjuring of one. German Chancellor Angela Merkel stated that she was saddened by the referendum result and Renzi’s resignation. Finally, German Foreign Minister Steinmeier hoped for a quick conclusion of Italy’s governmental crisis. Italian political future: new government or elections? Italy will now have to face a political immediate future doomed with uncertainties. Since Renzi’s resignation, Italian President Sergio Mattarella must decide, after a round of talks with the parties represented in the Parliament, whether to opt for a government trying to stay in charge until the end of the legislature or for a transitional government that will lead the Parliament to new elections, possibly in the first half of 2017. Nonetheless, the actual political situation does not allow to foresee when next elections will take place: the anti-establishment Five Stars Movement and the Northern League, riding their success in the referendum, asked through their leaders for immediate new elections. Forza Italia, while supporting the “No” front in the referendum, asked instead for a new government in order to approve a new electoral law for next elections. Renzi’s party, Partito Democratico, has not yet spoken about the future, waiting for a meeting of the party’s leadership on Wednesday. 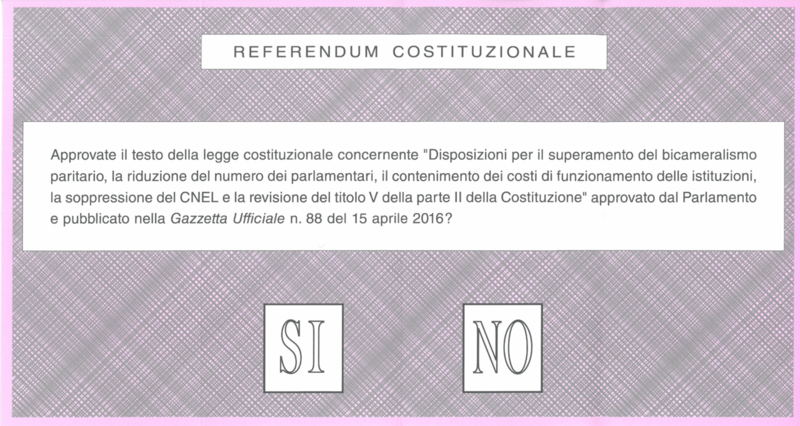 Photo:Voting paper Italian referendum December 2016, by Matteo Grisorio, Public Domain.